Kitten with a Whisk: Happy Halloween!!! My favorite holiday of the year! Where adults can act like a kid again and play dress up, and kids get to run around accepting candy from strangers. Something your mom always told you never to do! It's our first Halloween in this neighborhood so it will be interesting to see how many kids we get. 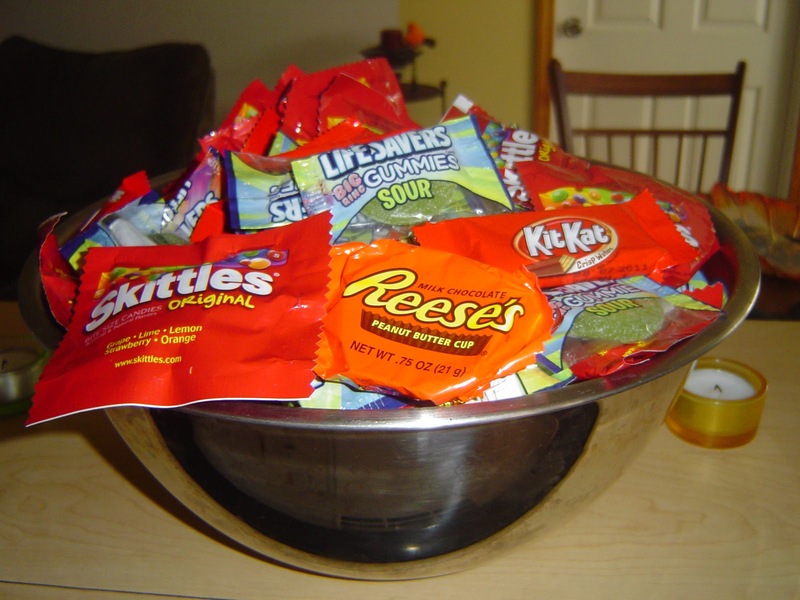 In our candy bowl we have: Reese's PB cups, Skittles, Kit Kats and Big Sour Gummy lifesavers. What's in your candy bowl? Do you have any favorites? Butterfingers. I must have Butterfingers in my candy bowl but Reeses are also a necessity. Only two? Ha! I don't know if I believe that ;) Kit Kats have always been my favorite! What about yours? welp, probably reese's cups. but we basically skipped halloween this year. it's like my husband is a seventh day adventist or something. he's kinda anti-holidays.